Furthermore, Sony have now set up a small website for Sonic & Sega All-Stars Racing transformed on the Vita. The site doesn’t have very much on it right now. But it does confirm that you will use the tilt functions of the Vita to turn your racers, and the touch screen to use weapons. Interestingly, the website also says there will be 8 player online & downloadable content. Release date is said to be Late 2012. Wow SASRT is looking pretty dam good. Hope it sells really well. Good luck to SEGA. correction: Do you have to use Tilt? 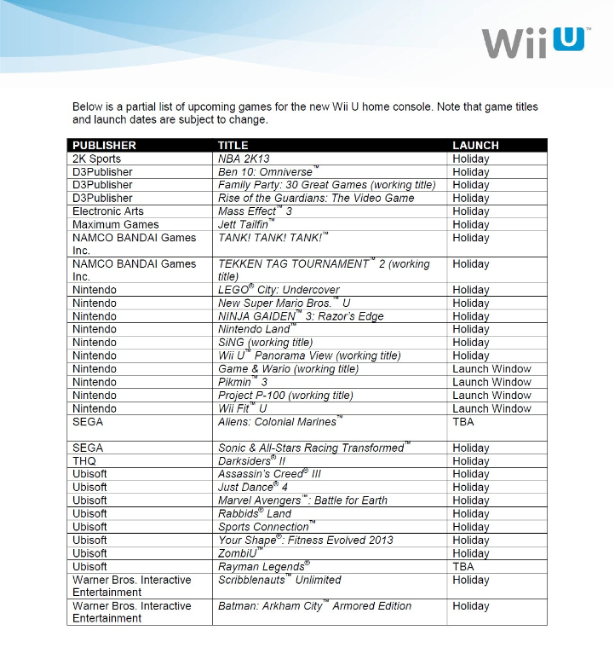 Unrelated, but some of those games I never expected to see on Wii U, Mass Effect 3 and Darksiders II, Arkham City too?! Now, Arkham City? Wah, didn’t see that one coming! All news to me, not really followed Wii U developments, just surprising haha! It seems this console is looking a bit more serious than the Wii. Hopefully it will be like the other racing games on Vita, optional controls. It’s similar to the VITA version. I’ve heard. Nothing will be special about it. No exclusive Nintendo characters. SEGA of Japan is not endorsing it at all. Also this version will ship in December and won’t launch on Wii U.
is Sega still presenting tomarrow too? Yes! The game is on Wii U! Okay… the console itself doesn’t seem THAT impressive to me, and it’ll cost a lot… but if there is any console I’d want this for, it’d be the Wii U. I had the first on Wii so this would be a good sequel on the sequel of the console. Plus…. maybe if we, MMMMM, persuade them… they might try Mario again. Holiday stands for November – December. Nintendo said the Mario Bros. U will come holiday – and at the same time as the Wii U. Just because Racing Transformed says it too, does not mean that it is actually going to also be for release at the same time as the Wii U.